Log into your BURST Account, then from your Dashboard click Rebate History. Your Rebate History has four important sections. If lender commissions have met our advice fee, or you have paid it separately, this section will show when to expect the next rebate payment. This shows the date, amount paid and account where we deposited each month rebate, as well as the running total of commission we have already paid to you. 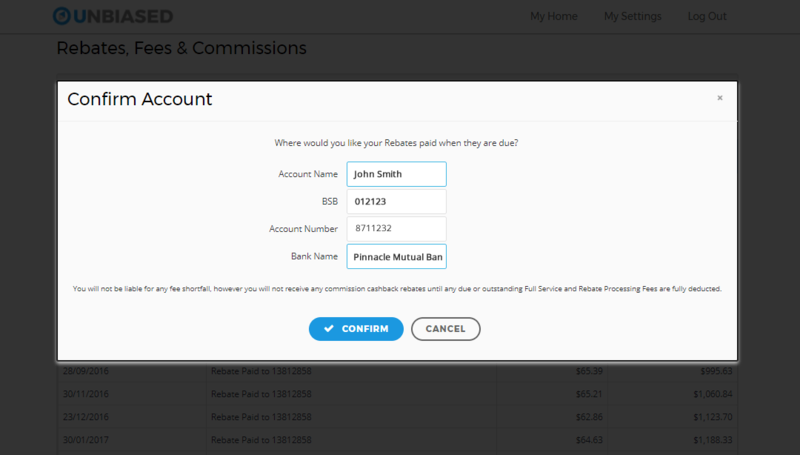 Click any row to see the actual breakdown of commissions and any fees applied to that payment. 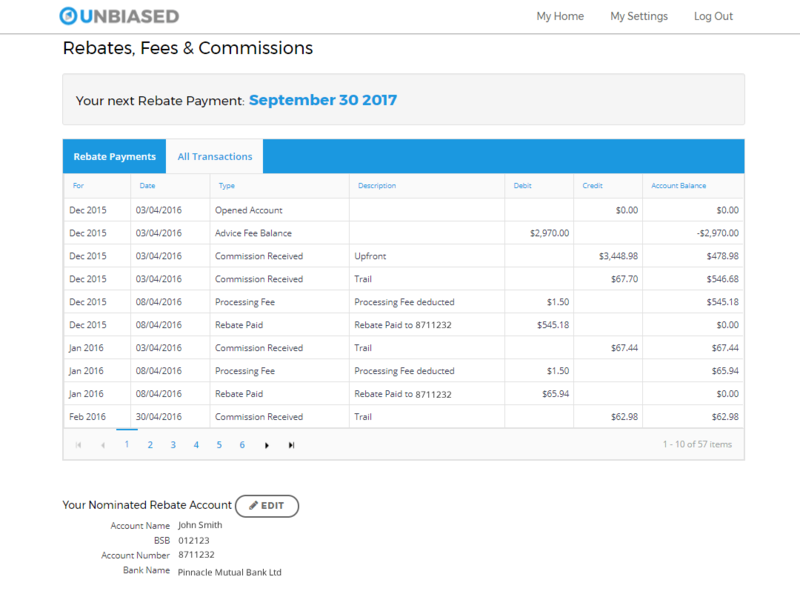 Click this tab to see each transaction for your Unbiased Rebate Account including individual commission receipts, deposit fees and rebate payments. This is the bank account where we will currently deposit your monthly rebates. Ideally, these should be the account details of either your offset account, or your actual loan account to compound savings. Note: If lender commissions have not yet met the Unbiased Advice Fee Section 1 will display any remaining fee; there will not be any record of Rebate Payments as they will not be made until commission exceeds the remaining fee. 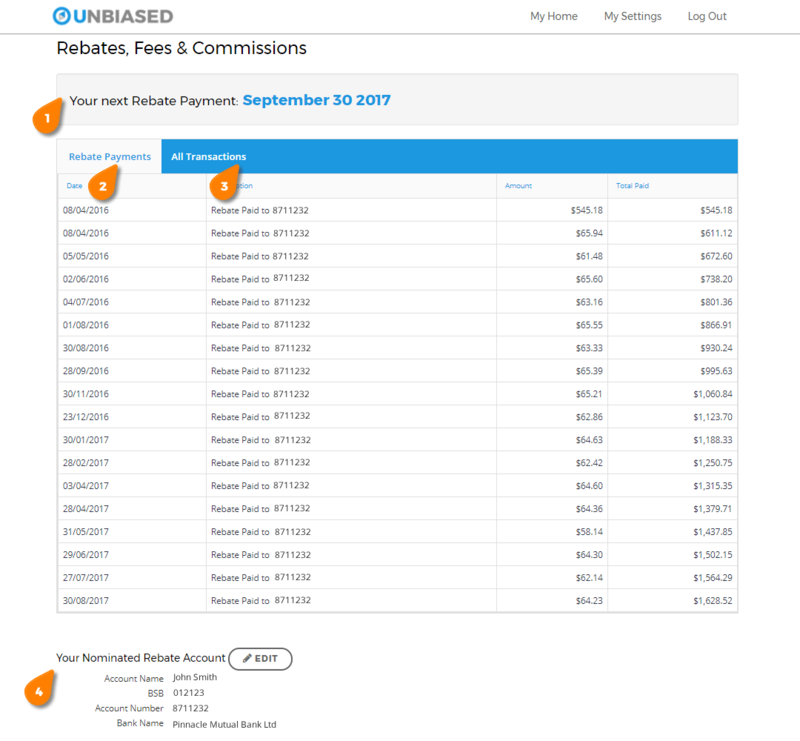 When you click anywhere on any Rebate Paid row, you will see each commission received and any fees or bonus payments included. The below example is the last rebate payment listed in the above screen shot. You will see all transactions including individual commissions received, any bonus and fees applied and rebates paid. This is where we will deposit your next monthly rebates. Ideally, this should be your offset account, or your actual loan account to compound your Unbiased Rebate Savings. Click the Edit Button to change your Rebate Deposit Account at any time. Congratulations on your decision to get independent , unbiased help with your mortgage . Thank you for choosing Unbiased Mortgage Brokers for this important financial decision. Just to prove you are a human, please solve the equation: 22 + 9 = ?